Best Salad Spinner 2017 - "Quick Take"
Some products simply don't have any competition worth discussing in any depth. For those categories, we've created this "Quick Take" to recommend the best product for most kitchens. It's the one that, after doing our research, we would buy ourselves (we may even already own one). The Oxo Good Grips Salad Spinner has spun to the top in expert tests for years and continues to get raves for its ability to thoroughly dry even the toughest greens. It features a simple, one-handed operation and generous 5-quart capacity. Owners love it too, and it's clear that this is the best salad spinner you can buy. No one wants to eat a soggy salad and the best way to avoid that is with a salad spinner. These basic gadgets use centrifugal force to quickly and efficiently remove excess moisture from clean greens. After careful evaluation of the available expert and retail reviews, it's clear that the OXO Good Grips Salad Spinner is the best of the bunch for most kitchens. 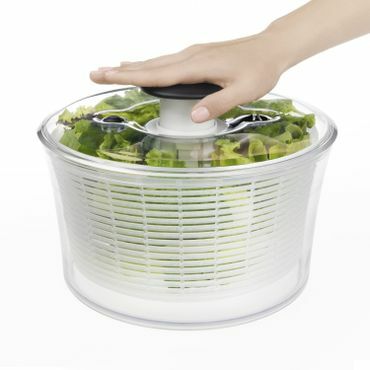 It's also available with a smaller, 3-quart capacity as the OXO Good Grips Little Salad and Herb Spinner (Est. $25). Testing at TheSweethome.com puts the Oxo Good Grips Salad Spinner on top for its sturdy design and ease of use. It's also a top performer when it comes to drying even thicker greens. OXO has been the top pick here since 1999. Other salad spinners are tested as well, but further details require a paid subscription. OXO easily crushes the competition in this test of nearly 20 salad spinner of all types. In testing, it is a top performer in every metric, but takes up a bit of space in storage, editors say. The OXO Good Grips Salad Spinner is by far the highest-rated salad spinner at Amazon.com. It earns 4.5 stars out of 5 in nearly 3,235 reviews; nearly 90 percent are 4 or 5 stars. BedBathandBeyond.com reviewers are slightly less satisfied with the OXO Good Grips Salad Spinner, giving an overall rating of 4.3 stars in about 145 reviews. However, these reviews are for both the large and small spinner, and the latter gets panned for its small capacity. In just under 85 reviews, the OXO Good Grips Salad Spinner earns 4.5 stars out of 5. Most agree that it's a top performer on both delicate and hardy greens.